There is nothing in this rice "ring" that is specifically for Rosh Hashanah. In fact, nuts are typically not eaten. However I couldn't help myself from making it as the accompaniment to the Pomegranate Glazed Chicken, since both are Persian-esque and the "gem"-studded white rice looks fabulous next to the ruby-colored chicken. I love how this rice is so colorful and so so so fragrant. It is festive and the circular shape is traditionally a metaphor for a complete and full year. My rice ring is inspired by two of the most beautiful cookbooks I know of--Diana Henry's Crazy Water Pickled Lemons and Poopa Dweck's Aromas of Aleppo--both of which are so full of gorgeous photographs and stories or histories that they could live on the coffee table and never make it to the kitchen. I've made Diana Henry's Jeweled Persian Rice recipe to the letter and it was delicious....but I doubt I'll ever have the stamina to do it again. 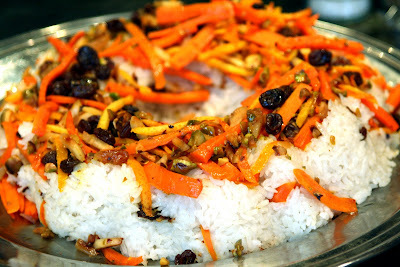 I've dramatically simplified her idea and merged it with Poopa Dweck's technique of baking rice in a ring mold to make this attractive and only moderately labor-intensive rice dish. 1 oz dried cranberries, sour cherries, barberries, or golden raisins, also plumped and drained. Rinse the rice very thoroughly(until the water doesn't look to starchy), then soak in a bowl of cold water for at least 30 minutes. Toast the nuts in a dry pan. Soak the saffron in 2 T of hot water. Mix cinnamon, cardamom, and rose petals together in small bowl and set aside. Use the big hole in a zester to make strips out of the orange peels OR remove the peels, separate and discard the pith, and julienne the peel. Place the peel strips in a small pot, cover with cold water and bring to a boil. Cook 2 minutes then drain and rinse. Julienne the carrots, cutting them into strips about 3 inches long. Heat the oil and 1 T of the butter in a pan and saute the carrot until it starts to soften, for about 4 minutes. Add the orange peel and sugar and continue to cook for another minute. 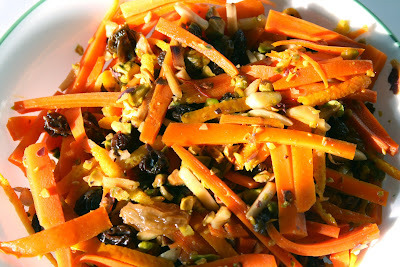 Pour in the saffron water, nuts and dried fruit. Remove from heat and set aside. Preheat the oven to 300°. Drain and rinse the rice. In a large saucepan, melt a tablespoon of butter. Add the rice and cook for about 2 minutes, stirring. Then add ~2 2/3 C water (how much water depends on how you like your rice and how long you soaked it--more water, tenderer rice). Bring to a boil over high heat. Then reduce heat to low and simmer, covered for 15-20 minutes. Remove from heat and let rest, covered and unbothered for 5 minutes. Then fluff rice with a fork. Spray a rice mold or bundt pan with non-stick spray. Spoon half of the carrot/orange mix into the pan, spreading it evenly over the bottom. Then spoon in half of the rice, sprinkling with half of the spice mixture. Then layer the remaining carrot/orange mix, spices and rice, gently pushing down to firm into the mold. Cover with foil and bake for 20-30 minutes. 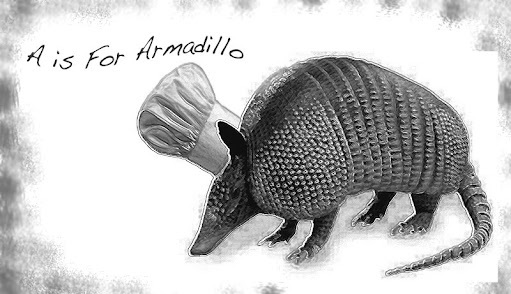 Remove from oven and invert onto a platter. You could drizzle it with melted butter to up the shine!